Here’s the description of The Martian Confederacy, a new series of full-color graphic novels published by Girl Twirl Comics: “Toxic air. Bloodthirsty politicians. Drinking bears. Welcome to Mars in the year 3535. Stripped of its natural resources and forgotten as a vacation destination, Martians struggle to afford breathable air. Boone, Spinner and Lou were three outlaws looking out for themselves. But when a cure for Mars’s toxic air falls into the wrong hands, thieves are forced to become heroes. 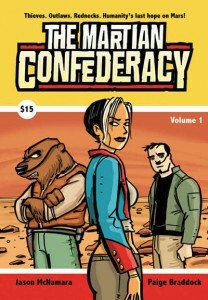 And as an entire planet gasps for air, three rednecks will fight for the survival of their planet.” It should be mentioned that the three main characters here are a human male, a female-shaped android, and an 8-foot tall talking bear working to protect his wife and two cubs. The eagerly-awaited second issue of the series is coming out in October. 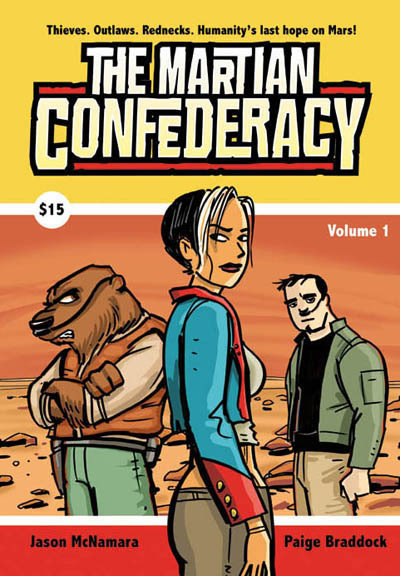 The Martian Confederacy is written by Jason McNamara (First Moon) and illustrated by Paige Braddock (Jane’s World). Visit their web site to see more. The well-known, Ursa-Major Award-winning Ratchet and Clank video game series is now being released as a 6-issue full-color comic book mini-series by the Wildstorm imprint of DC comics. 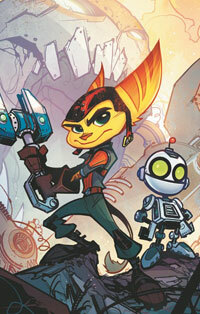 The story takes place in the aftermath of the Ratchet and Clank: A Crack in Time game. Here’s how the publisher puts it: “With Dr. Nefarious defeated and the universe safe, galactic heroes Ratchet and Clank return to the Solana galaxy for some well-earned rest and relaxation. But when entire planets begin disappearing from the universe without a trace, Galactic President Qwark calls them back into action to solve the mystery. As the rest of the universe erupts in panic, the duo must embark on an epic adventure that will pit them against their most capable adversary to date: a Markazian planet thief named Artemis Zogg!” The series is written by T.J. Fixman (an employee at Ratchet and Clank’s home base, Insomniac Games) and illustrated by Adam Archer. Look for it stores this September. Disney and the Annie Awards split up! Word is spreading like wildfire around the industry newspapers and blogs that Disney/Pixar have completely withdrawn their support from the annual Annie Awards, presented by ASIFA-Hollywood. The Annies are considered to be the Oscar Awards of the animation industry, and Disney has been a financial supporter of the awards since 1972. But now (according to reports) Disney fears that the awards process has been skewed towards Dreamworks Animation, as evidenced by the 2009 awards when Kung Fu Panda swept everything — and Wall-E was shut out entirely. Now (again, this is the word going around) Disney fears that a similar thing might happen, causing How to Train Your Dragon to beat out Toy Story 3 in one or more categories. As evidence, Disney/Pixar have pointed to the fact that Dreamworks offers a free ASIFA-Hollywood membership to its employees as part of their employment package, and previously voting on the Annie Awards was open to all members of ASIFA, regardless of where they worked in the animation industry — if at all. This story is still breaking, and it will be very interesting to see how it plays out. Interestingly, because of the way the Annie Award rules work, Disney/Pixar films can still be nominated for the awards, and win them, even if they’re not official entered by the creators. Ani-Max is an animated TV series concept created by Sharad Devarajan and Gotham Chopra. With the series still in development, Dynamite Entertainment is releasing Ani-Max as a one-shot full-color comic book, written by Ron Marz and illustrated by Jeevan J. Kang and the artist collective known as Liquid Comics. “Lost and separated from his family during a vacation in the dense Amazon jungle, 12-year old Max Duncan is chosen by the Earth Spirits as the latest in a long lineage of planetary defenders. Entrusted with a mystical artifact known as the Animus Stone, Max gains the power to absorb the abilities of any animal he touches and transform himself into a human-animal hybrid for seven minutes at a time. Taking on the attributes of lizards, lions, tigers, elephants, spiders, dolphins, and more – sometimes the transformations are gross, weird and bizarre – Max has a power no one else in the world seems to have. 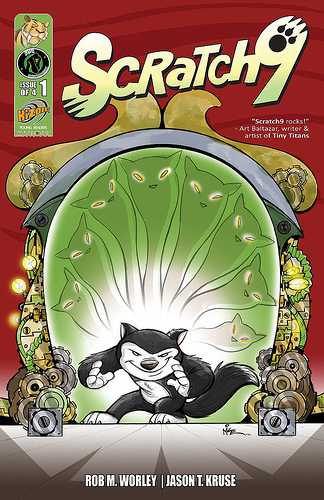 Joined by his faithful friends, Chris and Jenny, the three young heroes gradually find a way to use Max’s abilities to protect the planet and all its many creatures.” Comic Book Bin has more information and preview pages to see. The one-shot is available now. Fans of Jeff Smith’s award-winning Bone series are looking forward to Bone: Tall Tales, a brand-new full-color collection coming from (where else) Cartoon Books. Smiley Bone sits down at a campfire to tell a group of young bone scouts (and his rat creature friend) the story of Big Johnson Bone, the greatest Bone adventurer ever and the founder of Boneville. The stories originally published in the Stupid Stupid Rat Creatures mini-series are here, as well as new stories written by Tom Sniegoski. This new book is available now in hardcover and softcover editions. Check it out at Amazon.com. Scratch 9 is brand new 4-part full-color comic book mini-series, written by Rob M. Worley and illustrated by Jason T. Kruse. The first issue’s front cover was illustrated by Mike Kunkel, creator of Herobear and the Kid. Here’s the story: Scratch is the black & white pet cat of a little girl named Penelope… but little does she know that her pet cat is actually a superhero! Scratch has the ability to call up the powers of his previous 8 lives when he needs them. That can be especially useful when his first life was a saber-toothed tiger! Scratch 9 #1 is out this month from Ape Entertainment. Have a look at Mr. Worley’s Scratch 9 web site too. Animation historian Jerry Beck gives us the following on Cartoon Brew: “Animation storyman Phil Eastman (1909-1986) worked for Disney, Warner Bros., UPA, even Terrytoons during his career in the 1940s, 50s and 60s. But his biggest claim to fame has to be the series of Beginner Books he wrote and drew beginning in the late 1950s. Sam and The Firefly, Are You My Mother? A Fish Out of Water, and of course Go, Dog, Go! were certainly on my reading list at age 5. They influenced a lot of folks who later went into animation and comic art. I loved those books and still have my original battered copies. Now Sue and Tony Eastman (Phil’s son, and one of the best animators in the business himself) have put together a new website dedicated to his father’s books. Tony writes: Its purpose is to entertain/inform, and at the same time sell books. There really wasn’t a place where you could see all of his books together, plus we thought a short biography (appropriate for children) and a way to get in touch with his family would be useful. ” You can visit the P.D. Eastman website to find out more.